So where did 2016 go? I think the theme of 2016 for me was procrastination regarding this site. I had planned on reviewing The Force Awakens when I got back from Christmas vacation, but I kept putting it off. I certainly did not stop listening to, reading, or watching Sci-Fi. The last movie I watched was actually Rogue One, which was great! I guess I’m a bit selfish, as I certainly could have carved out the time to write reviews, but I had other priorities. I was working with my wife on a job search that took up almost all most of my free time, and hers. What free time I did have was spent watching TV to unwind after applying for jobs. We didn’t start keeping track until June, but between then and October we applied to 50 different jobs. In the end I found possibly the best job out of them all, in an area we want to live. Hopefully in 2017 I can possibly circle back and write up some high level reviews of stuff from 2016. My commute now is just over an hour on public transit, so I’ll be plowing through audiobooks like crazy at roughly 2 hours a day. I’ll try to take some time for posts about new books, movies, and games in 2017, but no promises! Well, we made it to 2013, narrowly avoiding the much anticipated Mayan Apocalypse. I’m not usually one for making New Year’s resolutions, but I am going to do my best to make at least two posts per month from now on. I’m still getting used to having much less free time since the birth of my daughter. Hopefully as she gets a bit older, I can incorporate some Science Fiction in her learning process. I’m already looking forward to Halloween. I’m not sure yet what to dress her up as. Any suggestions? Anyway, I hope you all have a great 2013, and wish you will come back to see some more frequent reviews. Where have I been lately? A number of factors have resulted in me not posting since December. One of which was that over the past few months I’ve been chipping away at The Collected Stories of Arthur C. Clarke. At just shy of 1,000 pages, it has been my lunch time reading for a while now. There are a couple short stories that I plan on reviewing, as soon as I can remember to bring the book home from work. I’ve also been filling most of my free time, 177 hours now, with playing Battlefield 3 (my stats). I’ve watched a few movies, but I didn’t get around to reviewing those. One was Gamer, which I didn’t expect much from. The other was Battle: Los Angeles, a cookie cutter “aliens attack, let’s fight back” movie. I didn’t really “watch” these as much as listened to them as I cleaned out my office. After going through my recent posts, I noticed that I never reviewed 28 Weeks Later. This was actually one of the sequels I’ve seen that I liked more than the original. I might have to re-watch, then write up a review. I watched a decent movie last night though, The Adjustment Bureau, which I plan on reviewing in the next few days, if not tonight. My goal for myself is to have it done before the end of the month. Thank goodness for leap years! OK, enough excuses. Thanks to all of you that still have me in your newsreader. I’ll try to be better about posting updates in the future. I finally upgraded my WordPress install today, and like a responsible web admin, I backed up my database and also my file tree. After my upgrade I noticed that my comments were all gone! I grumbled a bit and figured I’d extract the files from my backup. I opened my file up and noticed there were no comments. Doh! Where are they? I checked my backup from June, no comments. The latest backup I had with comments included was from February. The phpMyAdmin console showed the table “in use”. Not sure exactly what to do, I opened up a quick Live Chat with my hosting provider, HostGator, and noticed that I was #1 in queue with what, 147 agents available? My problem was fixed in less than 5 minutes. The fix also recovered a few comments that were posted after my last good backup. I apologize to those of you that tried posting comments the past few months, because they were all eaten up due to the table being locked. I’m not sure what happened, but the support guy told me how to fix it myself if it ever happens again. Essentially, there’s a GUI in the cPanel to check and repair individual databases. I work with MySQL quite a bit at work, but I wouldn’t consider myself a DBA. Now I need to find a better WordPress backup plugin, because I think it should have thrown out some type of error if the table wasn’t readable. Anyway, I’d like to take this opportunity to recommend HostGator. If you need hosting, please check them out. Any signups done through my link will help pay for my web hosting. Also, you can use code SCIFI25OFF for 25% off your first order. They offer 1 click WordPress installations if you are looking for something like that. Do you have a blog? What is your disaster recovery plan? Snowtrooper meet Luke Skywalker, time to die! I had the opportunity to meet a couple “online” friends this past weekend. I’ve talked to these guys for several years through various online games, instant messaging, Ventrilo/TeamSpeak, and e-mail. Meeting them was a very interesting and enjoyable experience. 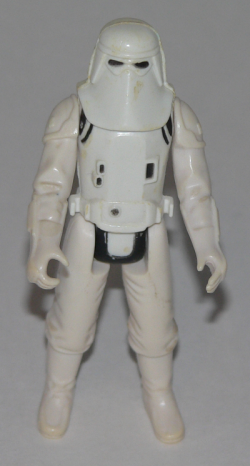 BrainAlien, a guy I’ve known online since 1999, gave me a Snowtrooper action figure. He knows I’m a huge Star Wars fan, so I really appreciate it. If I ever find my Luke Skywalker in X-Wing suit, I’ll have to have a little battle to relive some childhood moments. I haven’t really messed with Twitter much, but figured I could at least post updates on where I’m at in my reading as I’m going along. I’ve added the new “Tweet” buttons so you can quickly tweet any interesting posts you see here. I also plan on posting here more often than I have been the past year. I want to try and get back into the groove of posting interesting stuff between reviews like I used to. There have been some amazing developments in AI, robotics, and nanotechnology that I really should have mentioned before. I’m going to be tweeting all of my posts, but not sending all of my tweets back here. That would make my main site too messy. Want to see what I’m up to? Also, I haven’t yet replaced my StumbleUpon button since I went to this new theme. I’m looking into a plugin that has other social bookmarking features as well. I’ve been dissatisfied with my current theme for a while now. Wouldn’t it be nice to have a fresh look? I haven’t really touched the site design since I re-launched the site about 2 years ago with the new blog format. Please bear with me while I tweak the site with “Suffusion” by Sayontan Sinha. I’m very impressed with it so far. There are so many easy to customize options. Let me know what you guys think! I had so much going on the past month! I’ve also decided I’m going to go back and review short stories in Asimov’s Robot and Foundation Universe in the order of Johnny Pez’s Insanely Complete Fiction List that I have hosted here. I’m not sure when exactly I’ll start that project, but most likely I’ll post entries here and there as I complete them. Please bear with me as I’m working on doing some final touches on a move to a new web host. Well, it looks like everything is up and operational! I’ve been a bad reviewer lately. I usually try to write my reviews right after viewing or reading but I haven’t had as much time to write them lately. I’ve been playing World in Conflict quite a bit lately, which competes with my reviews here. I should actually do a review for that sometime, since I spend so much time playing it. It takes place in an alternate reality where the Soviets invade the US in 1990. For more information in the meantime just click the link above. I’m also in the process of reading two books: Children of Dune by Frank Herbert , and The Age of Spiritual machines by Ray Kurzweil . The latter is not really science fiction, but I’m about half way through it and many of the ideas probably seemed like fiction back when it was published in 1999. Many of the predictions Kurzweil makes in the first half are fairly accurate, so I’m interested to see what he will say in the second half. My next major milestone will be to read Chaos Theory, Asimov’s Foundations and Robots, and Herbert’s Dune: The Fractal Aesthetic of Epic Science Fiction . That should keep me busy for a little while.